Back in college, Jill’s favorite food was broccoli. As noted in a previous post, Jill’s current favorite food is eggplant. 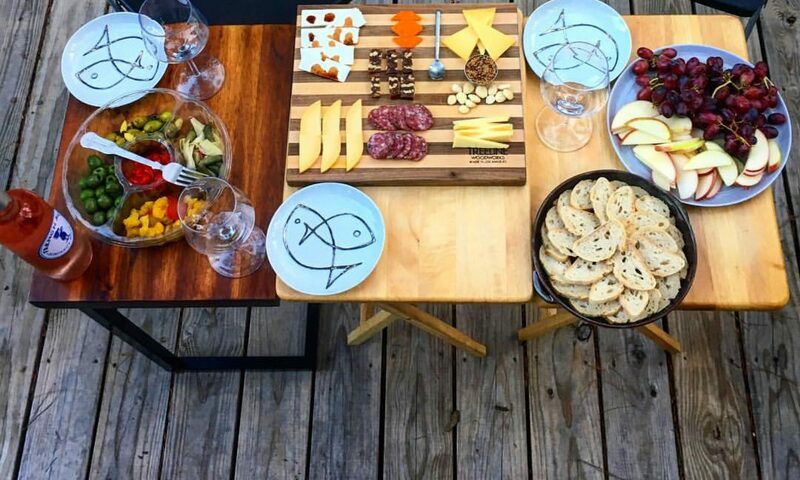 This current favorite is followed closely by tofu. 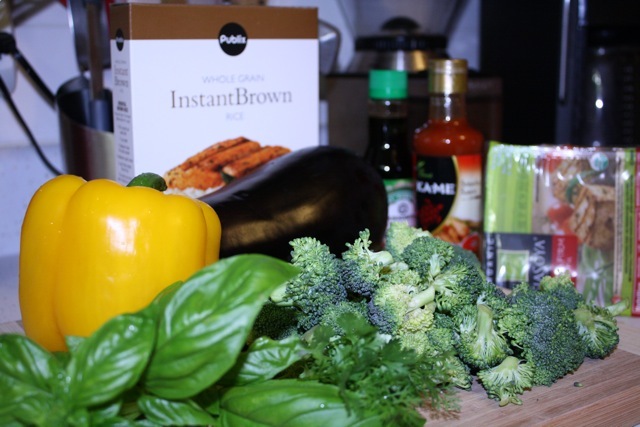 In honor of these favorite foods, I created this stir fry. Although I have a well seasoned wok, I always have better luck cooking tofu in a non-stick pan, so I made this stir-fry in a large non-stick pan instead of a wok. 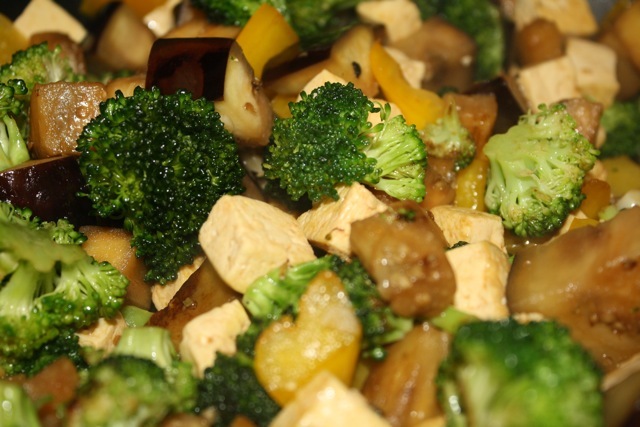 To make this stir-fry, first cook the the tofu: heat 1 to 2 tablespoons vegetable oil over medium heat. Add four cloves of minced garlic and about 1/4 teaspoon of finely chopped lemongrass stalk. I added the fresh lemongrass because I have it growing in my garden, but it can be left out of this recipe. Let the garlic and lemongrass infuse flavor into the oil for a minute or two, then, with a slotted spoon, remove the garlic and lemongrass from the oil and set aside in a small bowl. 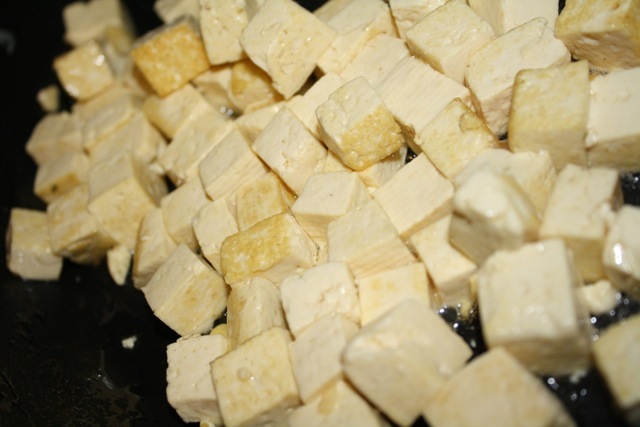 Gently sauté the tofu cubes in the flavor-infused oil until they turn golden brown. 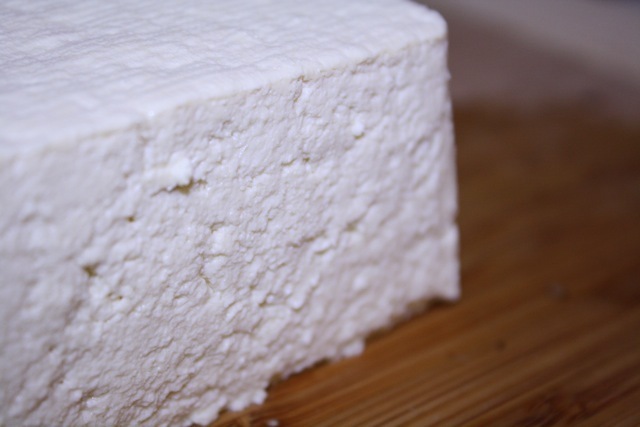 Once golden brown in color, remove the tofu from the skillet and set aside. Add the broccoli florets to the pan and stir-fry for about two minutes. Add the eggplant and cook together for about three minutes before adding the yellow pepper. Stir-fry the broccoli, eggplant, and yellow pepper together for another two minutes until the vegetables are cooked but the broccoli and pepper are still slightly crispy. Add the garlic and lemongrass mixture and the tofu to the vegetable mixture. In a separate bowl, combine three teaspoons of Sriracha sauce, six teaspoons of low sodium soy sauce, six teaspoons of water, and one teaspoon of sesame oil. Add the sauce to the stir-fry mixture and stir gently to combine. Top with a chiffonade of basil and cilantro and cook until the sauce is absorbed, about two or three minutes. 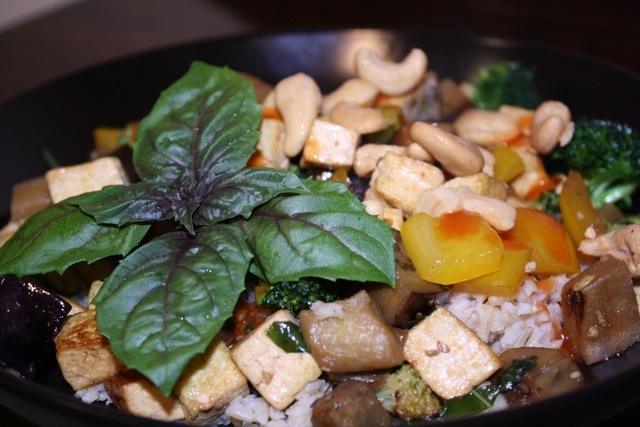 Serve the stir-fry over brown rice and garnish with cashews, basil, and sriracha sauce. Since the sriracha sauce is somewhat spicy, I added a little more to mine than I did to Jill’s.